Warm wax therapy is not a new invention, it has been used for many years to alleviate aching joints, sore muscles, and sports injuries. It has also been particularly beneficial in treating conditions such as Arthritis, Rheumatic disease and Tendonitis. It is also very useful to relieve the pain that accompanies some types of foot and heel problems. Warm wax therapy works by increasing the blood flow to the skin, relaxing the underlying muscles and joints. The wax melts at a temperature cool enough to apply to the skin, but warm enough to have a therapeutic effect on the area being treated. Its high specific heat capacity ensures it holds its heat well, and as it cools relatively slowly, it is a useful treatment for conditions such as stiff joints and scar tissue. It also hydrates the skin, leaving the feet, hands or treated area of the body soft and smooth. Because of its hydration properties Warm Wax Therapy is also suitable for dry rough skin, cracked heels and callouses. At Holcombe Health Clinic Geraldine will be using the PRENDE ORB SYSTEM, for Warm Wax Therapy treatments. It is a much improved system on traditional wax baths. 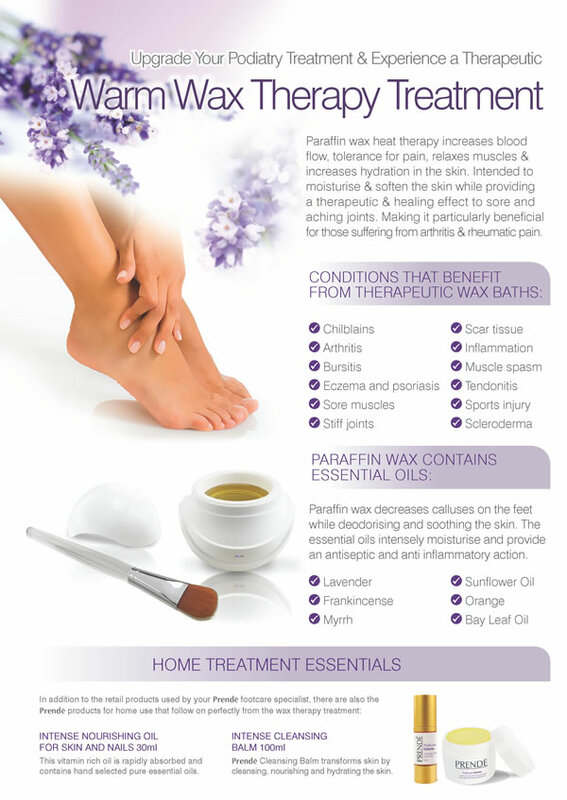 The paraffin wax contains sunflower oil and also essential oils lavender, orange, bay, frankincense, and myrrh. The treatment uses the PRENDE ORB, which warms, by thermostatic control to the correct temperature, a disposable single use wax pot. The wax is applied in slow soft brush strokes over the feet or hands. The feet or hands are covered with a plastic protection and then wrapped in a towel to hold the warmth of the wax. After 10 – 15 mins the wax Is removed and the feet or hands massaged with a rich moisturising cream. A short medical history will be taken before the treatment as there are some contraindications for the WARM WAX THERAPY, such as any allergies to the ingredients of the paraffin wax, open wounds, blisters, or inflamed skin. Diabetic patients or patients with vascular disease are not recommended for this therapy. A complete treatment usually lasts between 20 and 30 minutes and costs £30.00.